The modern history of Houston dates back to 1836, when two prominent figures in the real estate business, John Kirby Allen and Augustus Chapman Allen, purchased more than 6,000 acres / 2,430 hectares of local land with the intention of founding a town. 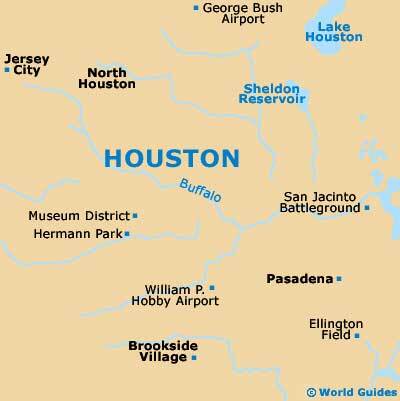 They took the name Houston from the Texan president of that time, Sam Houston. The town was incorporated as a city the following year, making it a milestone in Houston history. It also became the county seat of Harrisburg and was temporarily given the status of Texan capital. Houston successfully established itself as a center of trade during its earliest days, thanks to the creation of a chamber of commerce in 1840. The Chamber of Commerce promoted shipping at the nearby port of Galveston, notably of cotton for export. By 1860, railway links to Houston and onto Galveston had been firmly established. 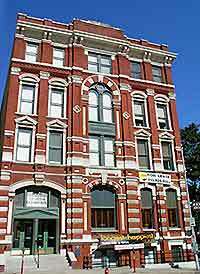 The city's rapid growth was restricted somewhat during the American Civil War (1861 to 1865), although the crucial Chamber of Commerce kept business going as best as it could. The city was under the control of Confederate forces for much of the conflict, but was taken by the Union in 1865. The post-Civil War years were difficult for residents, as an atmosphere of lawlessness hung over the city. A hurricane in 1900 hit Galveston hard, meaning that Houston had to be developed into a deepwater port much quicker than had been anticipated. Fortunately, the railway system had been expanded in the years following the Civil War, and waterway links between Galveston and Houston had been improved. Oil was discovered in 1901, marking the beginning of boom times. Workers flocked here as the Houston Ship Canal was built and 12 oil companies were set up in the city. In 1912, the Rice Institute opened, later becoming the Rice University. The university is located in South Main, which is one of the most interesting parts of the city. South Main is also home to the Museum District, where places such as the Buffalo Soldiers National Museum allow visitors to learn about the city's military history. Of note, the Museum District receives more than seven million visitors each year. Houston's deepwater port opened in 1914, but the suspension of shipping activities during WWII was a setback. However, the manufacturing industry continued to grow, as wartime demand for oil-based products was unprecedented. In 1945, the Texas Medical Center opened in the South Main district. Nowadays, the huge complex hosts some of the world's best hospitals. After WWII, the economy focused on the port once again, as the city began to form the huge sprawl that it is known for today. In 1963, the Rice University donated land to NASA and this was used to open the Manned Spacecraft Center. The center was later named the Lyndon B. Johnson Space Center and went on to become known around the world for hosting NASA's astronaut operations. This was how the city became known for one of NASA's most famous sound clips - 'Houston we have a problem', as pronounced by the ill-fated Apollo 13 space flight. Nowadays, visitors can learn more about the center's history by visiting the Space Center Houston, and in particular the team who helped bring the astronauts home safely from that doomed mission. The center exhibits include moon rocks, space capsules and other hardware. Meanwhile, the shuttle simulator is among a number of interactive exhibits. The Arab oil embargo in the 1970s meant that Houston's position as one of the world's biggest oil centers was cemented further. However, the population growth which resulted from this 1970s boom reversed somewhat in the 1980s. Besides a drastic drop in oil prices, the 1980s saw the city's renowned space industry suffer as a result of the 1986 Challenger space shuttle disaster. A recession towards the end of the 1980s brought this bleak decade in the history of Houston to an end. Since then, the aerospace industry has seen a resurgence, while the emergence of biotechnology has reduced the reliance on oil to drive the local economy.